Why do men worry so much about thinning hair or even total loss of hair? Through this post about hair loss, I participated in a campaign on behalf of Mom Central Consulting for Viviscal. I received product samples and a promotional item as a thank you for participating. So what is the big deal with hair loss? Is this just a concern for men or is it a concern for the wife/significant other of the man? The concern of hair thinning or hair loss varies from guy to guy. Besides my husband, I asked 9 other guys questions about hair loss and thinning hair. Most of the guys had thinning of hair in their early 20s with a few seeing the greater loss in their 40s. I asked them several questions and most of them were very open and sharing. What are your thoughts on thinning hair or hair loss? Does your husband or significant other have this issue? Leave your comments below. I'm looking for thoughts from guys and the gals that love them! I'm wondering why hair thinning and hair loss is such a sensitive topic for men? With my questions to the 10 guys, I asked them this very question. I got a lot of various answers. Here are their responses to "Is hair loss a sensitive topic?" When I was going bald right out of high school it made me feel old. I am old so I don't mind it now but would have 10 years ago. Going bald makes me feel and look too old. I didn't want to look old so I shaved my head bald. I feel older and don't think I look handsome. My wife wants me to get hair implants so I am going to for her. I want to look young like my wife and with the thinning hair I look too old. I don't care that I'm bald. My wife likes it. I also asked those who were concerned about balding and thinning hair if they were using something for their condition or if they had ever thought of using something. I don't need creams, lotions, potions or sprays. My wife wants me to get hair implants. I thought of buying that hair spray hair that I saw on tv. Is that stuff real? I would like to do something besides shave off my hair but I don't know what to use. I'm would take a pill if it would help my hair grow back. After asking my husband and some of our guy friends, I found that my husband and some do not care if they have hair or not. Those that were concerned wanted to know what was available to them so I shared this information below. As I stated at the beginning this post is about hair loss and thinning so I do have information for you and for the guys who were interested in knowing more about hair loss. 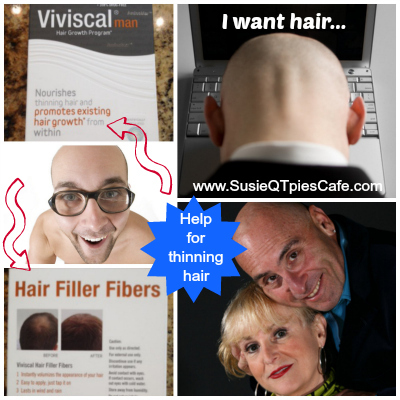 Check out the Viviscal Man website where you can get free information on Viviscal Hair Filler Fibers. Through my blog you can get a 10% discount on Viviscal Man and Viviscal Hair Filler Fibers on Walgreens.com. To take advantage of this discount just enter the promo code “VIVISCALMAN” at checkout. This offer runs through the month of July.